Thailand has evolved over time with many small fishing villages transformed to bustling tourist meccas, but the strength and beauty of Thai culture has not been lost. The cultural layers of this much-loved corner of South East Asia have been built upon and grown, influenced by neighbouring countries and supported by the tourist trade. 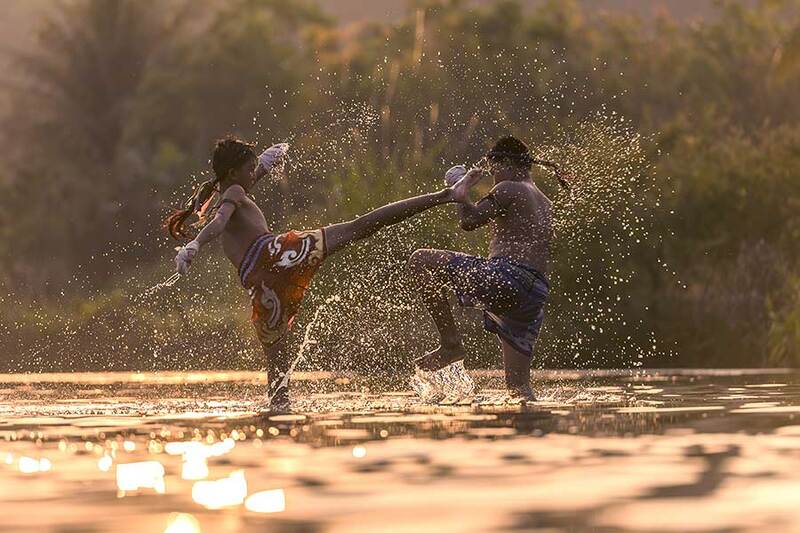 Peel back the layers one-by-one and you’ll find something to impress every member of your family or travelling party—from the history of the wats to the vibrancy of the festivals, the pulsing adrenaline of a Muay Thai match and priceless encounters with local wildlife. Wherever you go, you’re sure to experience the warmth and exoticism of the Thai way of life, but there’s a rich vein to be mined in the tourist hot-spot of Phuket, where all of the best Thailand cultural experiences can be found. Get amongst the crowds to experience the atmosphere and adrenaline rush of Thailand’s national sport, Muay Thai—a form of close-combat that dates back hundreds of years and makes for edge-of-you-seat viewing, with events 3 nights a week at Bangala Boxing Stadium. Get up close and personal with a different kind of local at Gibbon Rehabilitation Centre in Thalong, where gibbons rescued from the pet and tourist trades are given a second chance at life. Phuket Elephant Sanctuary is the ethical choice to meet these gentle giants, where you can volunteer or join an observation and feeding tour, with programs running in the morning and afternoon. For the more traditional culture hit, you can’t miss Wat Chalong – Phuket’s oldest and largest Buddhist temple. Soak up the beauty of Thai architecture and art, or find peace in the sacred halls and breezy grounds. 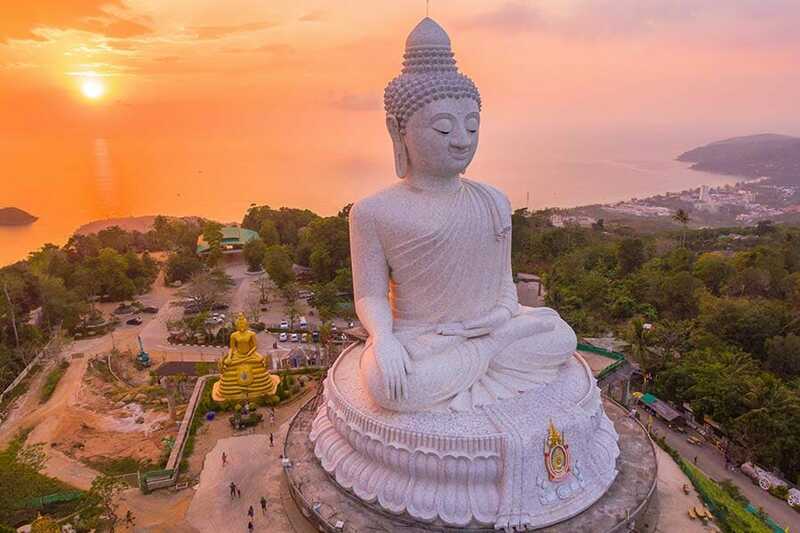 Climb into the Nakkerd Hills to come face-to-face with Phuket’s Big Buddha, a 45-metre white marble statue with sweeping views over Phuket Town and the surrounding beaches and bays. While on the opposite coast in the Gulf of Thailand, Koh Samui has its own Big Buddha at Wat Phra Yai, and plenty of local culture to experience in the villages and islands. The Thai calendar is bursting with festivals celebrating Exotic Thai culture year-round, but there are two national festivals worth noting (and perhaps planning your visit around). Loi Krathong, the Festival of Light (usually before mid-November) is celebrated with rituals at various Buddhist temples, but the most popular is launching the krathongs: floating lanterns with candles, joss sticks and your own wishes inside. Large bodies of water are illuminated with thousands of these twinkling lights, creating a truly magical experience. Songkran, the Festival of Water, marks the Thai New Year in April. Traditionally a period of reflection and familial respect, it’s also become a great excuse to celebrate and get wet! By midday it’s no holds barred with even the local police getting in on the fun. Expect to be deluged with buckets of icy water and everyone (especially small children) equipped with water guns.